Today’s garden feature is an inspiration to a Potager Garden from long ago. It comes to us from the 1.6 acre mini farm of Sandy Greig from Eldred, New York. Eldred is located 5 miles from the Pennsylvania border in the rolling hills of New York. Sandy created her garden in the likeness of an old-fashioned potager garden. A potager garden allows for the harmonious planting of vegetables, herbs, flowers close at hand. It makes heading out to find a meal a simple adventure – and the results of Sandy’s Potager Garden are simply stunning. When I bought my country house in 2016, it had been neglected and vacant for more than 2 years. But I felt it had promise to become a cozy place to rest while developing the 1.5 acres of land into a mini-farm. At just under just 800 square feet, the house had a good roof and clear well. The cosmetics were in dire need of an update. I found myself looking out the large living room window and thinking how nice it would be to have a beautiful garden right outside the door. French potager gardens have always intrigued me. In a design I call “formal whimsy”, a potager would make harvest easy and close at hand for vegetables and herbs and by adding flowers. The garden provided for all the senses. Throughout the winter, I began to plan how the garden would be shaped. There are a lot of deer nearby, so I knew it would have to be fenced. I took into consideration what produce would benefit my family. I also had to consider the daylight hours and shade and height and colors of the plants. By spring, had a budget, and was ready to begin. Old tree stumps were impossible (for me) to trim or get out. Breaking up the ground with a rototiller would have been impossible. The ground was also severely compacted. And rocks – rocks were everywhere! All of these conditions made normal gardening practices beyond a challenge. So to make the space more usable, I opted for raised beds for the vegetable garden. I first laid out stakes approximately 36′ out from the house and across the full width for the fence. It was within this space that my version of portage garden would take shape. I connected fencing to the house and placed in 2 gates. 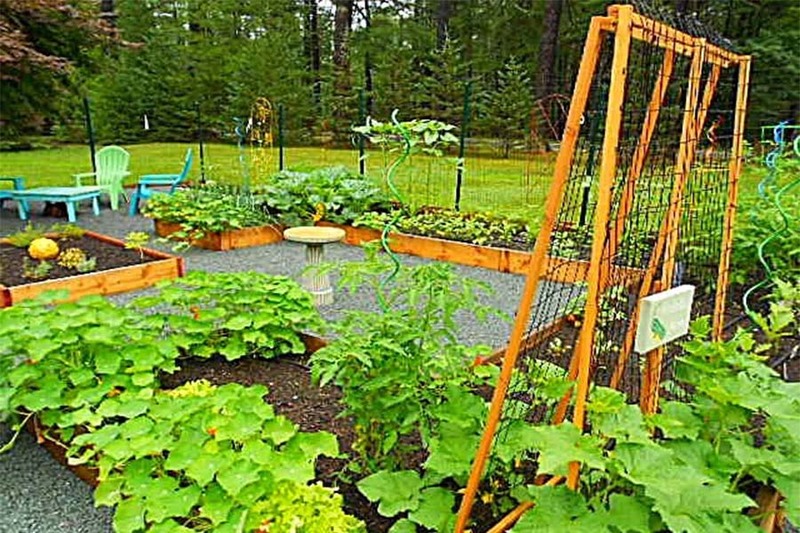 The raised beds were constructed of 2×10’s, 8′ long. I overlapped 2×4’s on some of 2 x 10’s to create the beds. I used exterior screws for all of the corners. Once the main frame was complete, it was obvious the ground sloped and dipped. To remedy, I had to dig out soil to level. I used stakes and screws in some places to hold the beds level. Having given up on perfection, eye-ball level was good enough. A local excavation company brought in yards of a fortified compost/top soil blend and filled the beds for me. Once the beds were filled, we put up the fence. My friend Rick and I did the fencing using 6′ Blue Hawk wire fence and 6′ T-Post stakes. We set the stakes about 6′ apart, more than enough to keep out the less than aggressive deer. Some areas were so dense with rock, we had to dig out a hole to put the stake into and re-fill with dirt. It was both time consuming and exhausting, but eventually we had it all together. We used rough cut 1″ lumber and ripped 4″ wide pieces to seal the fence to the ground. We were also hoping to keep out small animals (which seemed to work), AND make a barrier for the stone I would add later to the garden floor. Since I’m often away for days at a time, we added drip irrigation with a timer. Then we went to work on figuring out the gates. The T-posts have pre-drilled holes, allowing us to add wood to frame out the gates. That gave us something to attach the pre-made wired gates to. At $25 each, the pre-made gates were a low cost decorative addition to add style to the garden. I’d read that deer will not jump an enclosed portal, so I added a cross piece at the top with screws. Fencing was a must to keep the deer from having at the garden. I did have a deer later get in the garden, but luckily, it caused no damage. From then on, we used bungee cords to close the area over the cute gate. From that point on, deer have not been a problem. Meanwhile, the garden area closest to the house was planned. Since this spot is gradually shaded from about 1 PM on, most of the planting was developed for perennial, shade tolerant flowers. All of the work was done by hand. I even uncovered enough rocks to edge the garden! The whole, unplanted garden space was covered with landscape fabric to prevent weeds from coming through. Plants were added to the flower beds and vegetable seeds were planted in the raised beds. I then covered the ground in pea gravel. While I waited for the plants to grow, I went to work staining and painting the house! My theme for the garden was inspired by Dale Chihuly, a renown glass artist who frequently displays his pieces in gardens. Bold color, squiggles and orbs were added to mimic a Chihuly installation. And I adopted a metal mascot to guard the door. A seating area is shaded by the beautiful red maple tree in the afternoons. Being comfortable in the garden is so precious. Friends love to sit and chat. The feeling of being in a room is protective and it’s great to witness nature in this peaceful setting. The garden provided a bountiful harvest. I have to say, it was inspiring to know this was just a first year garden. And that’s how we came to expand the living space of our small house. From the living room we are called out by the garden which never sleeps. It offers beauty, produce and inspiration everyday. You can find out more at Bringing The Farm Home – and follow along on my garden adventure! Send us your garden story or tip! Thank you Sandy for your incredible garden tour. We love your take on the Potager Garden theme! Do you have a garden tip you would like to share? Or perhaps a few photos and a short story on your own garden?